Sir Mick Jagger has been reliving his youth at his old school, Dartford Grammar School for Boys. The Rolling Stone frontman opened an extension to its arts centre, the Mick Jagger Centre, ten years on from when he first launched the centre. He also returned to see how the centre is working to foster new musical talent. 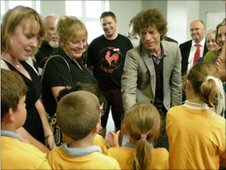 Sir Mick funds a project which delivers music tuition to over 150 local children. The project, called Red Rooster, provides 150 young children music tuition at the centre as well as their own instruments. Red Rooster also delivers music classes in seven local primary schools. 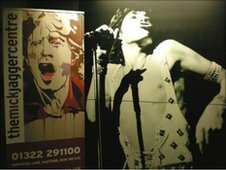 The Mick Jagger Centre is equipped with recording and video studios as rehearsal rooms and gallery spaces. Before officially opening the new extension to the Mick Jagger Centre, Mick said, "I've been given a very warm welcome, I was taken to the headmaster's office. It's always difficult to go into that room, without feeling a pang of some sort of guilt!" During Mick's visit, Dartford Grammar and Red Rooster pupils gave a short performance of a variety of musical talents. Afterwards, Mick chatted to pupils, parents and staff. Returning to Dartford, brings back "some incredible memories" to Mick. Although, he no longer spends much time there it seems maintaining a connection with his hometown is important to Mick. He said: "It's part of your consciousness, you're brought up somewhere for this very formative part of your life. I didn't move around I was just here. So, it helps to create you in a lot of ways." While waiting to meet Mick, John Summerfield, Red Rooster's double bassist specialist, said: "I think it's very important that the kids realise what an icon he is to Britain." Michael Philip (Mick) Jagger was born and raised in Dartford. Both of his parents were teachers and he has a younger brother called Chris. Mick attended Dartford Grammar School for Boys before going on to study business at the London School of Economics. The Rolling Stones started in the early 1960s as a rhythm and blues cover band with Mick as the frontman. Copyright © 2017 BBC. The BBC is not responsible for the content of external sites. Read more.